Llin-Manuel Miranda, the subject of Ishmael Reed's new play read at the Nyorican Cafe. Audience response to The Haunting of Lin-Manuel Miranda, a new entertaining, witty and historically incisive play was unusually enthusiastic. Ismael Reed's work was still in street clothes with scripts in hand. The actors, despite the trappings, delivered their lines with pathos and conviction, and Reed's vision shown through the bare-bones milieu. Broadway's extraordinary successful show, Hamilton, was laid waste, without deriding the talent or intentions of the remarkably talented Miranda or his cast. But what if – postulates Reed, the truths of Hamilton's relationship to slavery, native-Americans, immigration, people's democratic participation itself were to become part of the dialog? In this piece, Miranda is haunted by the ghosts of those impacted by Alexander Hamilton's (Tom Angelo) actual beliefs and practices. These slaves, 'Indians', and indentured servants (laves, Naive Americans and indentured servants (Tommie J. Moore, Malika Iman,Sara-lyn Macarthur,Jesse Bueno, Lisa Pukuiski), come to haunt the successful Miranda. The bewildered but concerned showman argues for Ron Chernow's (Robert Mailer Anderson) interpretation of the 'facts' and reveals that this biography of Hamilton had been his inspiration and the only source for his information. Although the always informative Reed has led us into what might be viewed as an academic historical controversy, we are bemused by the tale as it unfolds. 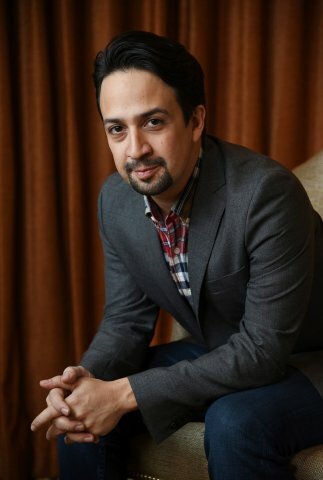 Miranda's cast is multi-racial, his Hamilton reflects the aspirations for a 'post-racist' society in modern America . There in fact was nothing post racist about Alexander Hamilton or his time and place. In the turbulent years of the revolution of the thirteen colonies, the founding fathers wrestled with these painful issues and laid the underpinning of the society in which they still remain our legacy and our burdens. Historians can and will pull apart the nature of the contributions to our constitution, and laws made by the remarkable men who designed our foundation as a nation. Denying or reinventing the fabric of their realities does not enhance our understanding of our present predicaments. The Schuyler family, for example, into which Alexander Hamilton married, was not just a 'rich' family. They were a slave holding family in New York at a time when many New Yorkers were manumitting their slaves. Hamilton's in-laws, despite membership in the manumission society (the act of an owner freeing his or her slaves), held on to theirs who were not 'a few house servants', but rather farm laborers on their extensive estate. Reed's play gives us an opportunity to see some historic truths. In truth, Alexander Hamilton was an ambitious and personally competitive man who crawled his way into “society” from very bare circumstances. Yet he is not a 'nice guy' looking out for the welfare of the poor. His philosophy of government and of social stability was for control of the un-propertied masses by the bankers and other elite. His belief was that the Native Americans were savages who needed to be exterminated and whose lands needed to be confiscated by the new nation. And his vision of slavery was that, though distasteful and likely to be come abusive, the abolition of slavery was to be kept out of the constitution. Far from being a beloved founding father among his friends, he collected a host of personal rivals and political enemies. These are not secrets. Hamilton was the most brilliant financial analyst of his time and prodigious writer, as were many his revolutionary contemporaries. Their arguments are part of the historic record. These ideas are all in print and readily available for students of history. The Haunting of Miranda challenges the sugar-coating of history, and the burying of truth with a 'feel good' version of the past. Reed's witticisms and barbed dialogue moves us through these historical dilemmas with an entertaining aplomb. The play, now in its undressed version will be up and fully staged in April. It is something to keep your eyes on. "...a courteous mention of the actor who played Miranda would be appreciated. All other actors are mentioned after their character name ."